Running Toward Domestication: My Instant Pot Arrived! Disclaimer: I am a true amateur in the kitchen and I do not recommend following any of the brief instructions that I have laid out below. My husband barely trusts my kitchen skills and we have been together for almost 7 years. Please consult your Owners Manual or at least another, more experienced kitchen blogger for more clarification on how to use this magical appliance. 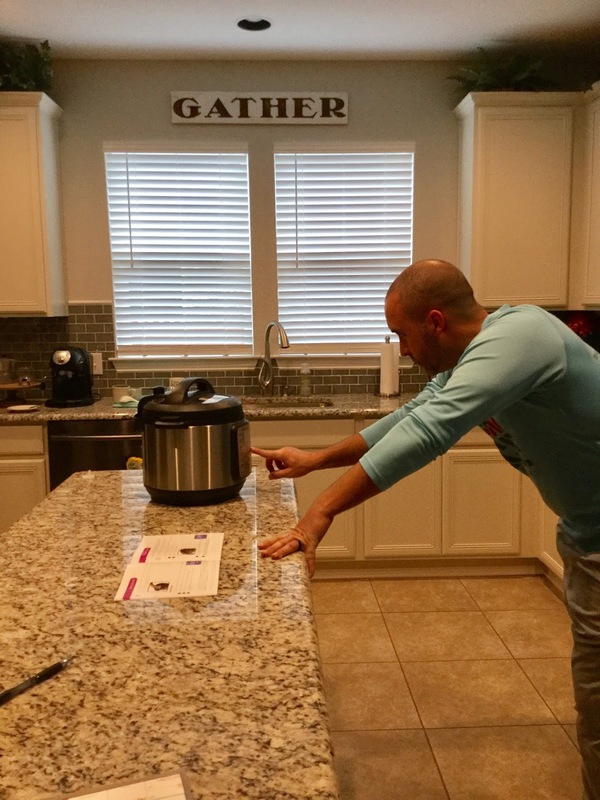 Just as I suspected, Amazon Santa delivered me my very own Instant Pot to my front door at 8pm on Christmas Eve. We didn't even wrap the thing! Just slid it right under the tree :) For a brief 48 hours, my model was $20 off the normal price with 1 day free shipping and BOOM... all my dreams came true! (okay, not all of my dreams but you get the picture). We had a pretty low key Christmas around here. The temperature dropped pretty quickly in Austin and staying home in our PJs was an obvious choice. After opening gifts and getting through breakfast, Joanna and I did some playing while Brad took a snooze (he worked all night long). Then Joanna passed out herself around 11:30am and I was able to start reading my Users Manual. In true Ganey curiosity, Brad began tinkering with my new toy himself. I'll admit, I was a little intimidated and kept telling myself, "No, you cannot get into the pot... Not until you read the Users Manual first!". So, he took the thing apart and washed all the pieces and set them out to dry. There is a "float valve" at the top of the cooker, and this indicates if there is pressure in the pot. If the float valve is all the way UP... there is pressure in the pot and this basically means that its like a little bomb if you open the lid (or a big one, I don't really know. But bomb means bomb and I don't want to find out). If the float valve is all the way DOWN... then there is no pressure left in the pot (all the pressure has been released via the Steam Release Handle either naturally or forced by moving the handle yourself) and it is safe to open the pot.... only if the valve is all the way DOWN. I don't want any bombs going off in this house! I am positive that we will refer back to this Users Manual frequently as there are like 9 Programs on this little pot with their instructions of how to operate, some troubleshooting tips and cleaning instructions. Brad's only complaint was how long it takes to dry while sitting out on the drying rack. It seems to have several pieces or areas in the lid that can catch water and may require a hand towel to finish drying before you put it away. Although, almost all the pieces are dishwasher safe! For us, we normally hand wash our pots and pans and only load plates/bowls/cups and utensils in the dishwasher. That way we only have to run the dishwater 1-2 a week. Weeknight meals - these are the more simple, less prep meals that take minimal time from prep to serving. We are normally eating dinner by 6pm and if we aren't then Joanna is ravaging the pantry and eating all the snacks. These meals need to take less than 1hr from start to finish. Weekend meals - these can be the meals that require more prep, sautéing, steaming, etc. Maybe I can explore dishes I normally wouldn't cook, because I'll have more time and flexibility to put this thing to the test on the weekends. Gourmet meals anyone? So that kinda sums it up. On Tuesday we did cook our first meal - Brad and I were both home from work and we had chicken thighs sitting in the fridge ready to go. I'll share that recipe and pictures very soon!